EVE Pulse speeds towards the holidays with episode 4, looking at all things EVE Online. 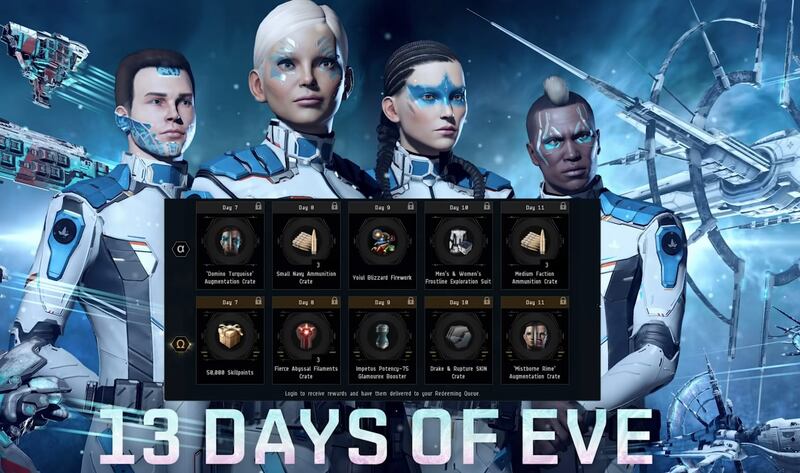 The new December release is featured, alongside a host of festive happenings like the 13 Days of EVE campaign, Operation Permafrost in-game event, Yoiul Festival SKINs and more! I’d have to check with you here. Which is not one thing I normally do! I enjoy reading a publish that will make folks think. Additionally, thanks for allowing me to remark! Thanks for this post, I am a big big fan of this web site would like to continue updated. You completed certain fine points there. I did a search on the issue and found the majority of people will have the same opinion with your blog. I think you have observed some very interesting points, thanks for the post. I’m excited to uncover this website. I need to to thank you for ones time for this particularly fantastic read!! I definitely liked every little bit of it and I have you bookmarked to see new stuff in your web site. Excellent read, I just passed this onto a friend who was doing a little research on that. And he actually bought me lunch since I found it for him smile Thus let me rephrase that: Thank you for lunch! “We steal if we touch tomorrow. It is God’s.” by Henry Ward Beecher. What i do not understood is actually how you’re not actually much more well-liked than you may be now. You are so intelligent. You realize thus considerably relating to this subject, made me personally consider it from so many varied angles. Its like men and women aren’t fascinated unless it’s one thing to do with Lady gaga! Your own stuffs outstanding. Always maintain it up! I blog quite often and I truly thank you for your information. Your article has really peaked my interest. I will take a note of your website and keep checking for new details about once per week. I opted in for your RSS feed as well. Good day! I know this is kind of off topic but I was wondering which blog platform are you using for this website? I’m getting sick and tired of WordPress because I’ve had issues with hackers and I’m looking at alternatives for another platform. I would be fantastic if you could point me in the direction of a good platform. Please let me know if you’re looking for a article writer for your blog. You have some really good articles and I believe I would be a good asset. If you ever want to take some of the load off, I’d really like to write some articles for your blog in exchange for a link back to mine. Please send me an e-mail if interested. Regards! Somebody necessarily assist to make critically articles I would state. That is the very first time I frequented your website page and up to now? I amazed with the research you made to make this actual put up incredible. Fantastic process! Right here is the right blog for anyone who wishes to understand this topic. You know a whole lot its almost hard to argue with you (not that I really will need to…HaHa). You certainly put a brand new spin on a topic that’s been discussed for decades. Excellent stuff, just wonderful! you’re truly a excellent webmaster. The website loading speed is incredible. It seems that you are doing any distinctive trick. Also, The contents are masterwork. you’ve performed a excellent job in this topic! Good post. I learn something new and challenging on sites I stumbleupon everyday. It will always be useful to read through content from other writers and practice a little something from their web sites. Merely wanna input on few general things, The website design and style is perfect, the content is real superb. “The reason there are two senators for each state is so that one can be the designated driver.” by Jay Leno. Wow! Thank you! I constantly needed to write on my website something like that. Can I take a fragment of your post to my site? Very interesting topic, appreciate it for posting. “Welcome to President Bush, Mrs. Bush, and my fellow astronauts.” by Dan Quayle. Spot on with this write-up, I really suppose this website wants way more consideration. I’ll most likely be once more to learn rather more, thanks for that info. Very interesting info !Perfect just what I was looking for! “One man’s folly is another man’s wife.” by Helen Rowland. Normally I do not read post on blogs, however I would like to say that this write-up very pressured me to take a look at and do it! Your writing taste has been surprised me. Thank you, very great article. Rattling instructive and excellent body structure of subject material, now that’s user pleasant (:. I conceive this internet site holds some rattling great information for everyone. “A sense of share is not a bad moral compass.” by Colin. Do you have a spam problem on this site; I also am a blogger, and I was curious about your situation; we have created some nice methods and we are looking to trade techniques with others, be sure to shoot me an email if interested. My brother recommended I may like this web site. He used to be totally right. This publish actually made my day. You can not believe simply how much time I had spent for this information! Thanks! I just like the valuable info you provide for your articles. I’ll bookmark your weblog and test once more here frequently. I am relatively certain I’ll learn many new stuff proper right here! Good luck for the next! It is truly a great and useful piece of info. I’m glad that you shared this useful information with us. Please keep us up to date like this. Thank you for sharing. Leave a Reply to alliance diamant Click here to cancel reply.